Please note, leaders and adults are always needed to assist with our trips. We encourage everyone to take an active part in assisting our troop for this weekend event. This form will become inactive at the registration deadline, so all scouts and adults need to be registered before the deadline. Parents and Adult Leaders must have completed Youth Protection certification. Please indicate if you are camping with the troop for the entire event or some portion of it. Please indicate whether you are willing to buy food for your patrol (or adults). Yes, I agree to abide by the Troop 115 Discipline Policy and understand the consequences as detailed in the policy . I agree to abide by this discipline policy during this trip and all scout events, meetings, and activities. Parents- I agree to ensure my scout understands this troop discipline policy and agrees to abide by it. ADULTS ONLY: I am approved and will assist the troop by performing the following function in my support of this camping trip. I can Drive the bus and I am approved by SPUMC to do so. I can pull the Troop 115 equipment trailer. I will provide car/truck transporation for those scouts who cannot ride on the bus. At what email address can we reach your emergency contact? If you are a scout, or registering a scout, what is your patrol? If you are an adult, please enter "Adult." Which patrol do you belong to? Please include the name and phone number of the person picking you up. If you are an adult, please enter "Adult." Have you either completed yours BSA Youth Protection Certificate within the last two (2) years or will complete and bring your certificate to Merry Ann Johnson or Crill Merryday A FULL WEEK BEFORE the camping trip. Scouts and Leaders must have verified current medical forms on file or they will not be allowed to participate in this event. 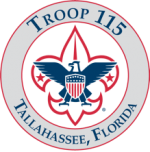 I grant permission to Troop 115 to use my image or the image of my minor child (scout) for the troop website or other materials for promotion or instructional purposes or other uses consistent with the goals and ideals of Troop 115, including, but not limited to photographs or video of Troop activity.